It's an easy 4th of July cake, all decked out in red, white and blue – or for Canadian readers, if you're not into the Canadian Flag Cake with a maple leaf emblazoned in strawberries, then it's a Canada Day cake, all decked out in berry red and crisp white. 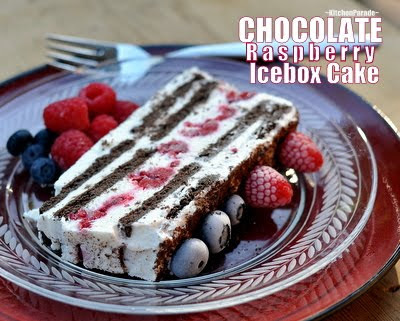 But more than that, an icebox cake is an easy summer treat, so impressive sliced onto plates with twelve – yes, twelve! – layers and yet so simple to assemble. I've used chocolate graham crackers and raspberries but the variations are endless. I love the idea of stunning layers of birthday cake – but somehow time and calorie considerations take hold and for a minute, I ask, Where IS the closest bakery? And another thing. To many eyes, bakery cakes look so good, so professional, that my homemade cakes, no matter how delicious inside, just aren’t going to match up to the “perfection” of all that shortening- and sugar-laden icing. Sad but true, to many, “bakery-bought” is better than homemade. I'm not giving up without a fight though and an icebox cake is my latest weapon – and so far it’s brought two tables to contented silence. It’s a cake you can’t really buy and doesn't it just look so pretty? Kids love it, grownups too! Plus it can be made several days in advance! And the variations are endless. How about weaving in a dreamsicle-style layer of ice cream or jewel-colored sorbet? How about other perfectly ripe summer fruits? Yes and yes, thank you. An icebox cake is an old-fashioned cake, a retro cake. But in the Battle of Home Baker vs Bakery, it sure meets my contemporary sensibility. ALANNA's TIPS Flavoring the whipped cream is important, otherwise, the cake is just too one-dimensional. It should taste really good! In my bread pan, the bottom layers of graham cracker needed trimming to fit crossways, the top ones did not. For four layers of graham cracker, I used two packs of crackers from a 14-ounce box. Some were leftover, I crushed these into crumbs in a freezer bag. Frozen berries work in the center layer because they’re less expensive and smaller than fresh. But for anyone lucky enough to have a surplus of fresh raspberries? Go for it! 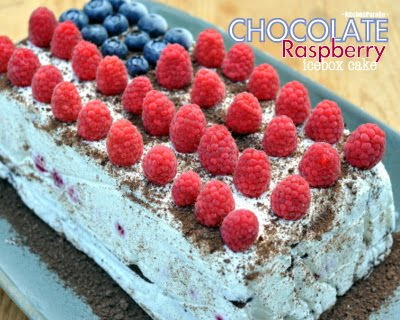 If you don’t want the fresh berries on top to freeze, embellish the cake just before slicing. The cake is much easier to slice, and you’ll get more slices, without fruit on the top. Still, the fresh berries make it looks so pretty, especially for 4th of July or Canada Day celebrations. If you want to go all Martha on this cake, make extra whipped cream and apply an outer layer after the cake has frozen, then embellish away. 1 tablespoon flavoring – vanilla, dry sherry, kirsch, etc. WHIPPED CREAM In a large bowl, mix cream, sour cream and flavoring until beginning to thicken. With the mixer running, slowly add powdered sugar. Continue whipping until very thick. ICEBOX CAKE Line a 9x5 bread pan with plastic wrap. Build the layers, following the list below. Once layers are built, press gently to remove any air bubbles, then wrap with plastic wrap. For whipped cream, use an offset spatula to spread evenly. For graham crackers, cut sharply with a knife if needed to fit. Place larger pieces on the outer edges, smaller ones on the inside. For raspberries, cover the entire layer with berries. FREEZE Freeze hard for at least 2 – 3 hours. EMBELLISH Remove the plastic wrap and carefully transfer to a cake plate. Sprinkle with graham cracker crumbs and arrange fresh fruit on top. Return to the freezer. SLICE With a serrated knife, slice cake onto plates while it’s still frozen but serve after the cake has rested at room temperature for 5 or 10 minutes, until the whipped cream is beginning to soften. 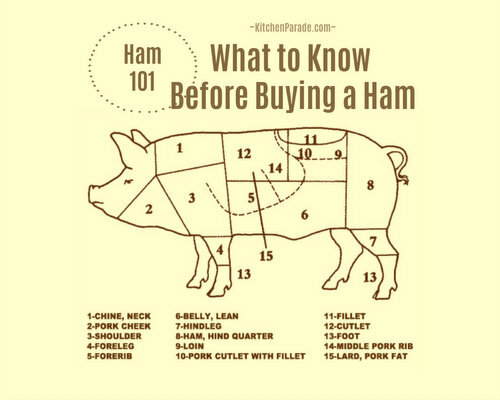 NUTRITION ESTIMATE Per Slice (assumes 16/12 slices): 199/266 Calories; 13/17g Tot Fat; 8/10g Sat Fat; 41/55mg Cholesterol; 122/162mg Sodium; 19/25g Carb; 3/4g Fiber; 2/9g Sugar; 2/3g Protein. 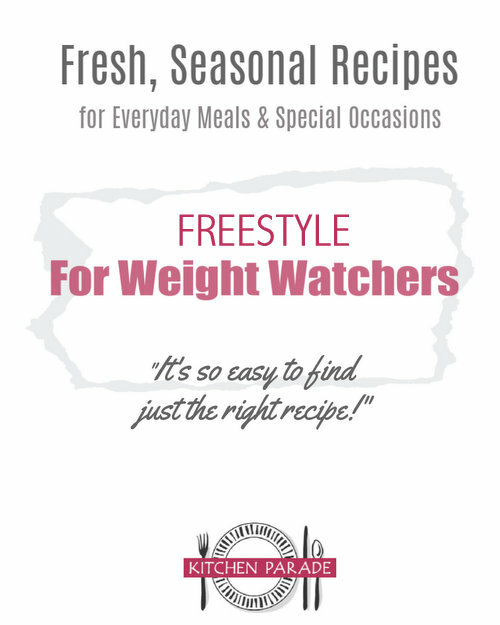 WEIGHT WATCHERS Old Points 4/5 & Points Plus 6/7. For precise, beautiful slices, slice the cake onto serving plates while it's frozen hard, then let it thaw for 5 - 10 minutes before serving. This is going on my to make immediately list - gorgeous, creamy, refreshing - my raspberries and Saskatoons will be both ready in about 10 days for picking. The graham crackers look chocolate they are so dark. I think I have a recipe for homemade ones I have always wanted to try and this may motivate me to - depending upon how hot it is! I also have a sour cherry tree and can imagine they would be great in a similar concoction!